Did you know that you own an art collection? The City of Edmonton Public Art Collection belongs to the citizens of Edmonton and contains more than 200 art works. As our city grows, so does the Collection as pieces are commissioned for new capital projects like LRT lines, bridges, recreation centres and parks. It’s yours to explore whether on foot or online. The City of Edmonton Public Art Online Gallery is an interactive site bursting with pictures, information, maps, and links to artists’ websites. Browse the Collection, plan a tour, or share with out of town family and friends. Public art is free to view and accessible to all. The City of Edmonton supports the acquisition of public art as a way of enhancing quality of life and livability for its citizens. Pieces in the Collection have been gifted or donated, created to commemorate a special event, or commissioned through the Percent for Art Program, adopted in 1991 and revised in 2007 and 2010. The Percent for Art Program allocates one per cent (1%) of the eligible construction budget of any publicly accessible municipal project for the acquisition of art. The Edmonton Arts Council directs the program, and provides vision for, and stewardship of, the City of Edmonton Public Art Collection. For more information about the City of Edmonton and public art visit the Edmonton Arts Council public art site. 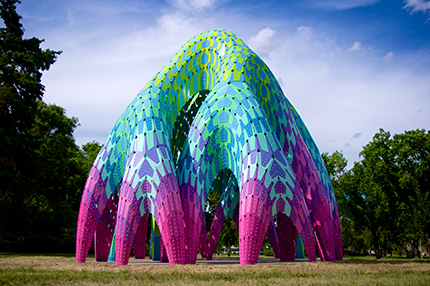 Photo: The City of Edmonton Public Art Collection - Willow by Mark Fornes & THEVERYMANY. Photograph courtesy of Doyle C. Marko / DCM Photography.